Prime Minister Manmohan Singh failed to break an impasse with opposition parties and his own allies demanding a rollback of the reform announced last week allowing foreign supermarket giants to enter a $450 billion market. K.K. Mital, head of portfolio management services at Globe Capital Markets, said the deadlock dashed expectations the ruling coalition, which has been blamed for policy paralysis after a series of corruption scandals, would pursue more reforms. “This has affected the sentiment," he said. “There are also some concerns about the GDP numbers due tomorrow." Property developer DLF fell 3.3% on uncertainty about the retail sector reform, after having rallied 7.1% over three sessions on hopes the liberalisation would boost demand for malls. Pantaloon Retail fell 11.9%, while Trent and Shoppers Shop lost more than 3%, chipping away some of the sharp gains made in previous sessions on hopes for tie-ups with foreign companies. 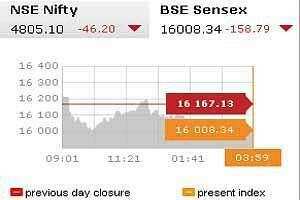 The main 30-share BSE index closed down 0.98%, or 158.79 points, at 16,008.34, with 20 of its components closing in the red. The benchmark, which is one of the world’s worst performers this year having fallen 21.9% since the start of January, had pulled back 3% on Monday on hopes for more market-friendly reforms. “People are also nervous ahead of the GDP data," Neeraj Dewan, director at Quantum Securities, said. Growth in Asia’s third-largest economy is expected to have slowed to 6.9% in the September quarter, the weakest pace in more than two years, a Reuters poll showed. Traders said investors were worried the growth could have dipped further, probably below 6.5%, as 13 interest rate increases since early 2010 and high inflation took a toll on consumer spending and investment. The data is scheduled for release on Wednesday. Citigroup has cut its growth estimate for India to 7.1% for the fiscal year ending March from its earlier forecast of 7.6%, citing domestic factors such as supply-side bottlenecks in the coal and power sectors and lagged impact of monetary tightening. “In addition to global factors, domestic issues should take a toll on growth in India," Rohini Malkani, economist at Citi India, said in a report. Reliance Industries, which has the heaviest weight on the main index, fell 2.4% after the energy major said it began arbitration proceedings against the government to keep its entitlement to recover costs related to KG-D6 block, off India’s east coast. The company said in a statement late on Monday it was concerned by media reports the oil ministry would seek to restrict the amount the company takes out towards cost recovery from its revenues from sale of gas produced from the D1 and D3 fields in the block. Mobile operator Bharti Airtel fell 3.6%, while software bellwether Infosys shed 1.45% and ICICI Bank lost 2.1%. The 50-share NSE index dropped 0.95% to 4,805.10 points. In the broader market, 872 losers were ahead of 561 gainers on total volume of 571.96 million shares. Euro zone finance ministers are set to meet later on Tuesday to approve detailed operational rules for the region’s bailout fund, paving the way for a €440 billion facility to draw cash from investors. The MSCI’s broadest index of Asia Pacific shares outside Japan rose 1.68% and Japan’s Nikkei was up 2.30%. Mahindra & Mahindra closed up 1.7% after brokerage Nomura said it expected the leading utility vehicles maker to post a 26.4% on-year growth in November sales. Everonn Education rose 10% after TV channels citing sources as saying the Securities and Exchange Board of India has cleared the Varkey group’s open offer.